joy magnetism: Back off, bub! Seriously. 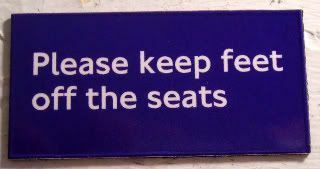 Until I started thinking about this magnet from the London Transport Museum, I don't think I ever realized how much having people's feet on my seats bugs the bejeepers out of me. Think about it. You're in a conference room with rows of chairs. You sit down, and all of a sudden, on the back rung of your chair, you feel two feet, schmulchzing around, trying to get a good foothold and get comfortable. All while you're trying to concentrate on whatever presentation you're at. You're sitting at a bar, and all of a sudden, you feel someone stick a foot on the rung of your chair, effectively blocking you in against the bar. Ok, ok, sometimes you want that. But really, sometimes? Back off, bub! You're in a darkened movie theatre, when all of a sudden, you feel a sudden pressure, of someone's feet on the back of your rockery chair. All while you're just trying to take mental note of what movies you're gonna see based on the previews. Hmmm, I really never knew how resentful I was of the feet on my chair. I'm guilty of all of the above, I know. Still. Back off, bub! This reminds me of the time when I was sitting in a movie theatre, and I tried to lean my head forward, and I couldn't. And I was like, OMG! These people have their feet on my hair! WTF! Back off, bub! After a few tries of moving my head forward, I was getting more and more agitated. Until I sat straight up. And realized that it was me. My hair was so long that my own back was keeping my head from tilting forward. I didn't even realize.